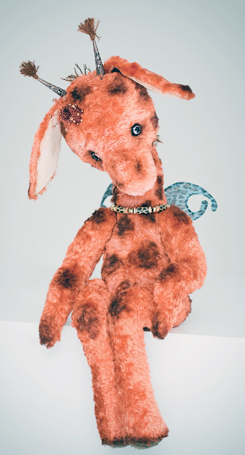 Growing up in the beautiful country of Lithuania, Ina Smirnova of Bears and Roses, is expanding teddy bear horizons in an area where teddy bears have not yet left their mark. 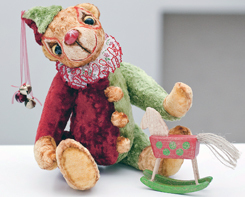 Ina is new to bear-making, which started for her after the birth of her third child, Polina nearly 3 years ago. 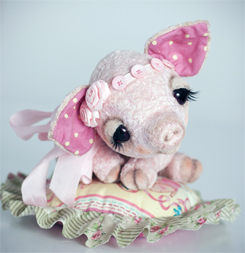 "When I was pregnant with my daughter, I started to make dolls from polymer clays. It was really interesting for me and I thought, at last I found this wonderful hobby and I will created only those from this moment on in my life!" It was during her doll-making time when one of her best friends, a professional doll-maker asked her if she might want to try bear-making. Ina replied, "What? Bears? Never! 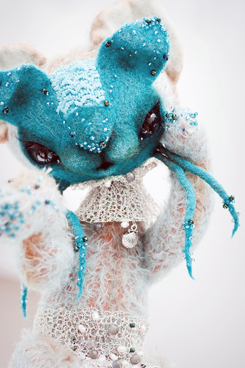 Because from this day on, I will create only dolls!" Now she knows to 'never say never' again! One day, after her daughter was born, she was checking some doll-maker Internet sites when she suddenly found an Australian bear makers Internet site. "Never before have I visited any bear-makers sites and I can say, after the shock of seeing them, I knew that I must try to create my own teddy bears." Although Ina's educational background is based in economics and accounting, which she admits has nothing to do with teddy bears, she did have a foundation of hobbies which helped her along her path, including sewing, knitting, needlework and découpage. With a new direction on her mind, Ina embarked on a new path. 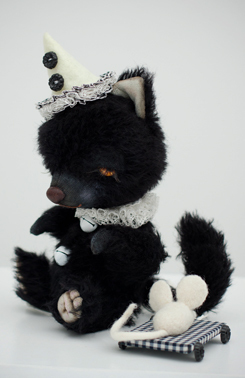 "I started to search for any information on making bears. I didn't find any teddy bear sites here in Lithuania. There were not any books or other information in the bookstores or on the Lithuanian Internet sites." 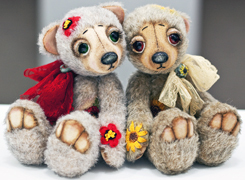 Luckily, Ina found many Russian and English speaking forums for bear-makers. "All my knowledge in this area I have gained from the Internet. Thank goodness for the generosity of some bear artists too." 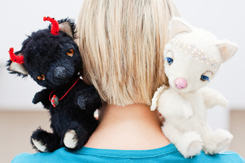 One day, after she had created about 5 teddy bears, she decided she needed to find more like-minded people in bear making in Lithuania so she started to promote this in one of the local forums. She organized a joint event, "Let's sew together a teddy bear." 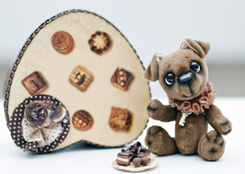 Each week, Ina would publish on the forum a new tutorial on making a teddy bear and after a month or so, their group had finished their very first teddy bears. "After that we had a contest and all the bears were the participants. Three best nominees received prizes from me. That was a good start for our Lithuanian bear artists." 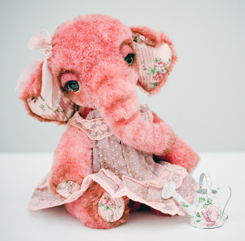 And now, Ina just can't stop creating teddy bears and buds. "Every creature is unique. All aspects, from the first stitch to the last tints of oil paints, I make by myself." 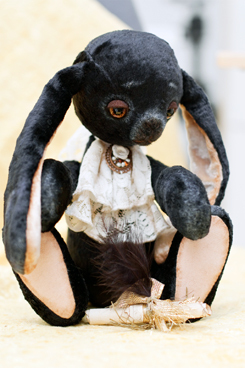 Ina loves all her furry creations and puts all her love and tenderness into making them. "That is probably why they find new homes very quickly." 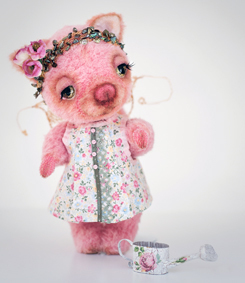 With the loving support of her husband, Sergej and the help from her parents and in-laws with her three children (Maksim, Jegor ad Polina), Ina finds some free time to create new teddies. However, because of her big family, she does not have an abundance of time to create, so she's able to make only 20-25 bears/buds a year. But even with her limited 'creating time,' Ina has won numerous awards and has been featured in several Lithuanian magazines as well. 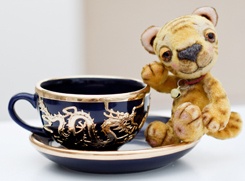 Using the Internet as her main selling arena, Ina shows her teddies on several blog sites, collectors and teddy bear forums and has participated in On-line shows. All which help her beautiful part of the world expand in its love of teddy bears. "Sometimes my friends will ask me if it's difficult to part with my creations when they find new homes. I can say that I am very happy when my teddies find their loving moms and dads. I love each one of them as if they were a little child. I think I would feel really sad if they couldn't find new loving families because that would mean that nobody other than me would love them." When she receives letters from her collectors saying how much they love her teddies, Ina feels so happy. "Then I know that I made this world a little bit more loving, beautiful and happy because that is the reason I just love creating teddy bears."